Hi...um, my name is Misty, and, uh, I`m kinda shy. I`m also pretty young, under a year old. I heard my foster mom say that I`m really sweet though...I think `cuz I like to sit on her finger when I`m in a quiet room away from her other birds, and I don`t like to bite her. I even like to have my cheeks skritched very gently sometimes, if people talk to me in a nice soft voice and sound like they like me and won`t let me get hurt! Mickaboo is taking care of me right now because someone abandoned me at a pet store, and one of the pet store people called Mickaboo and took me to a vet to get egg-zaminned (I think that`s how you spell it). I was pretty skinny, and my wings were clipped too much, and I had broken one of my new flight feathers that was growing in, and made it bleed. My foster mom made me drink some icky medicine stuff for a couple weeks, and let my wing feathers grow in, and gave me these orange and green things that I thought were just weird perches until I saw some other birds chewing on them! Now I`m pretty and healthy, I have a proper wing clip that lets me fly a little but not too much, and I know veggies (and pellets) are for eating. Mmm. 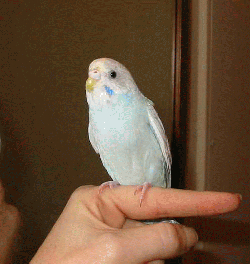 Oh, I saw on a budgie website that my color is opaline skyblue dilute, whatever that means! I just know I`ve never met another budgie who was the same color as me, and I`m happy my feathers are all fluffy and pretty now. All I need is some nice person to give me a safe and caring home with a budgie friend or three!